Last weekend, I decided it was high time to put on my big girl pants and stop eating cookies for breakfast and lunch. I’ve been trying to eat with The Lad and The Lass, and I’ve probably consumed more eggs, yogurt and fresh vegetables in the past five days than I had in the previous month. It seems a totally reasonable thing, to put the sweets back into the Sometimes Food category that preschoolers know all about. But, boy, I picked a terrible week to try this. Husband has been across the Pond since Sunday night, and The Lad and Lass have joined forces against me. It has been raining literal buckets in the Boston area since Tuesday, with little sign of stopping, making for a very housebound week with the mutineers. Mama does not want a glass of wine – she wants brownies. Gooey ones. But whipping up a batch of brownies seemed egregious – I couldn’t give in that completely. Still – I needed the kitchen to be warm and floury. I needed to smell bread in the oven. And, so, I pulled out the recipe for my grandmother’s sweet bread. My grandmother, or VoVo, as we call her, has made these lightly sweet braided breads for longer than anyone can remember. She makes dozens at a time, freezes them, gives them to her family, sells them at the church bizarre, et cetera. She even has these neat bread bags that read “From Vangie’s Kitchen.” Around the time I was newly married, I asked if I could come up to visit on bread-baking day to help … and to learn. It was a beautiful day for all sorts of reasons. VoVo is an amazing woman – tough as nails, gracious as they come, old school Portugee and Yankee all rolled into one. We have a big family – largely local – and time alone with the matriarch is precious. Baking bread in the quantities she does takes all day, and the rising times left plenty of empty space for visiting and sipping tea. I learned a lot that day – much of which has nothing to do with this bread. But, since this is supposed to be about the bread, I’ll share a few curiosities. First, despite everyone in the family believing it was a Portuguese recipe handed down from VoVo’s mother, who hailed from the Azores, the recipe is actually a version of Finnish nisu bread, given to my grandmother by one of her neighbors when she was first married. Second, I’m not entirely convinced that the recipe we wrote down as we baked is quite the one she knows by heart – the flavor is right, but the texture is not quite the same and the color is all wrong. But that might all be a version of baking terroir: I use butter, she uses margarine; she lives on the shore, where it’s always humid, I live in the interior ‘burbs and watch the crown molding separate because the heated air is so dry; she’s been doing it for 60+ years, I’ve been doing it for 6. Mostly, I think the lesson is that VoVo’s bread is like her – totally unique – you might approximate the experience, but will never replicate it. All that said, this is a pretty easy and a very tasty loaf. Flavored with cardamom, it’s perfect with coffee. 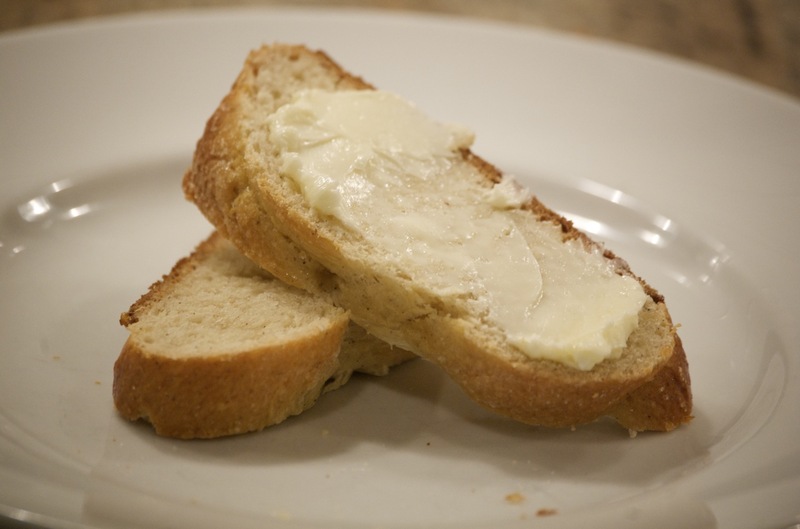 It can be a touch dry, so butter is nice, and it toasts well. I started the project at four in the afternoon; while it rose and then rose again and then baked, I managed to pull together a real meal for myself and the children, play some Candy Land, and tuck them in for sweet dreams set to a soundtrack of raindrops and wind (I hope). And now I’m enjoying a few warm slices, immensely grateful for this bread, for so many reasons. In a large warm bowl, dissolve yeast in warm water with a sprinkling of the sugar. Meanwhile, melt butter in a small pan over low heat. Stir in milk and allow to cool to lukewarm. Also, combine 2 cups of flour, 1/2 cup of sugar, the cardamom and the salt in a small bowl and set aside. When yeast looks bubbly (or, for instant yeast, when the yeast granules have dissolved), add butter and milk mixture and one beaten egg. 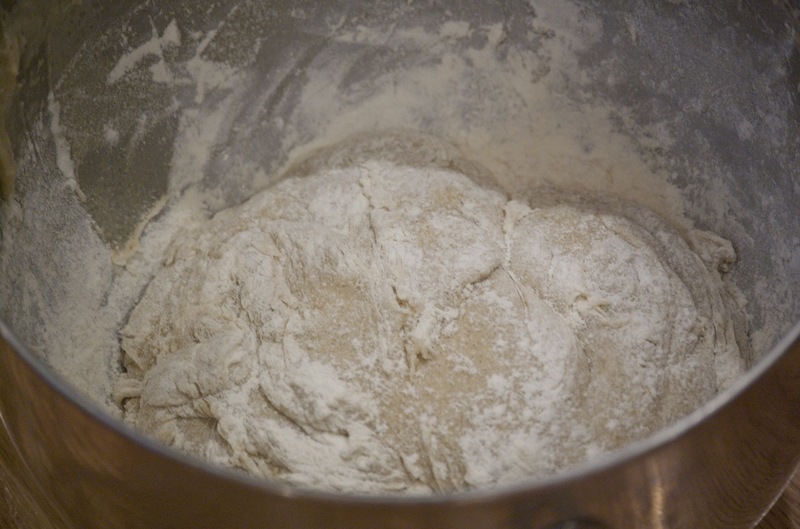 Add the dry ingredients to the liquid ingredients gradually, stirring with a wooden spoon until smooth and elastic, adding up to 1/2 cup more flour as needed. Note: you can do this in a stand mixer using the paddle attachment. It will be a very soft, wet dough in either case. more flour until dough remains just slightly sticky. 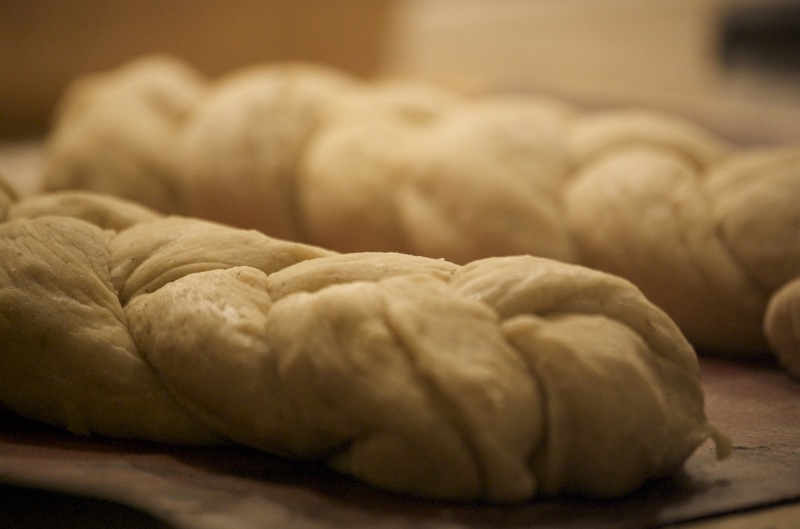 Divide dough into 6 equal pieces, forming 6 “ropes,” each about a foot long. again, 30 to 45 minutes. Preheat oven to 375°F. 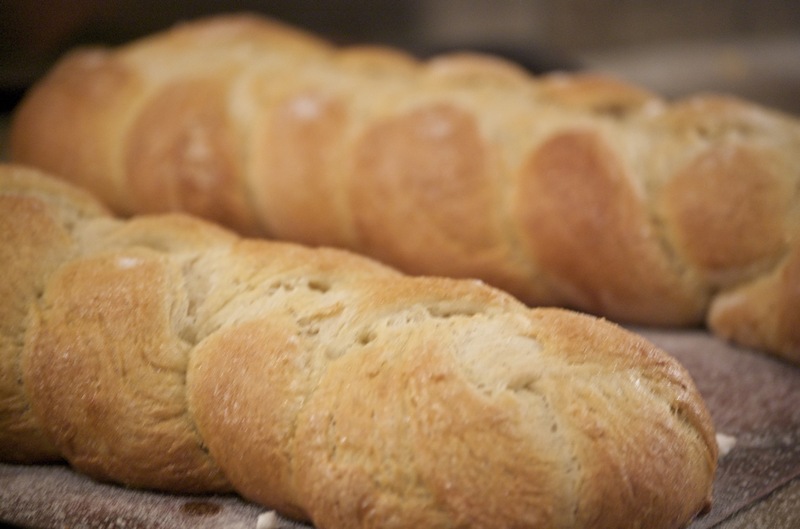 Brush the braided, risen loaves with the beaten egg and sprinkle with the 1/4 cup sugar. Bake 20 to 25 minutes or until golden brown. Internal temperature should be over 190-degrees F. Cool on a rack to room temperature. Beautiful post, despite the fact that I am six months late in reading it. I am enjoying your blog immensely (sp?). Thanks for being so generous with your time and talent.